Unemployment is an alarming issue in the country. Some don’t have the necessary skills to make it big in the professional arena. But there are candidates who possess the academic qualification, but still don’t have a job. For the assistance of such youths, the central government has announced the implementation of a special training course. The name of this unique venture is Varun Mitra Yojana. Under this project, candidates who complete the training successfully will attain jobs in suitable fields. Helpline Number 0124-2853039, 9999725683 and 9818156427. Development of better employment opportunities – The main objective of the implementation of this scheme is to pave the path for job creation in the energy sector. It will also boost the confidence of interested applicants, and they can start their business venture in the same sector. Awareness towards renewable energy sources – As the scheme has been organized by NISE and MNRE, stress will be given on creating awareness about the use and advantages of renewable sources of energy. Training for unemployed applicants – Under this scheme, jobless applicants will be able to attend this training. Once the training is complete, they will get jobs in the choses field. If they desire, they can also start their business with the acquired knowledge. 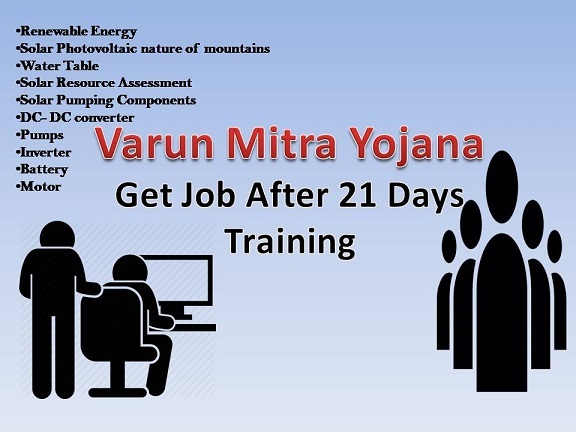 Free of cost training – The central government will implement this scheme for the betterment of the unemployed people. Thus, applicants will not have to worry about any fee payment. The entire training courses will be funded by the central government. Total number of beneficiaries – As mentioned by the PM, only 20 eligible candidates will be able to take part in this training course for the time being. Tenure of training – The scheme draft highlights that this training session will continue for 3 weeks. The total time duration of this course is 120 hours. It will start from the 1st of January and will end on the 19th of the same month. Training modes to be included – For overall understanding, all feasible training methods will be implied to make this scheme successful. Apart from classroom theoretical classes, trainees will be able to test their skills in the labs. They will also be taken to the sites to take a look at the actual machines. Industrial visits and creating projects will also be parts of this training. Financial aid for accommodation – Apart from the training, the central government has also decided that applicants will also attain financial remuneration, if they are traveling over long distance for this training session. In such cases, the applicants will have to make an additional request, stating their issue. The central authority will offer Rs. 600 every day to the trainee. For Indian citizens only – Only Indian citizens will be able to apply for this scheme benefits. Interested candidates from any state or UT will be able to apply as long as they possess the legal residential certificates. Must be unemployed – This scheme will allow the application of only unemployed people. If the applicant is associated with any job or business, then he/she will be barred from attending this training. Academic qualification – There are also some academic criteria, which applicants must fulfill. People, with diploma or graduation degree in Mechanical/Electrical/Electronic/I&C will be able to attend the training. Apart from this, PSU undertaking officials, people associated with solar power business and EPC contractors will also be able to attend these classes. Applicants will have to submit their academic papers to support their claims. ID proof – Apart from the educational proof, applicants will have to furnish their personal ID documents as well. The voter or Aadhar card will come in handy for this purpose. How to attain registration form and apply? All interested applicants will have to take part in the scheme by filling in an online application form. There is no offline enrollment procedure. To attain the digitized registration form, applicants will have to click on the link https://mnre.gov.in/sites/default/files/webform/notices/Revised%20Solar%20Water%20Pumping%20System.pdf. When the page opens, applicants will attain all scheme related details. They will have to scroll down to get to the actual registration form. They will have to download the registration document, fill in the necessary details, and submit their application accordingly. For final submission, applicants will have to send the registration form to any of the two IDs – nise@gmail.com or startups.nise@gmail.com. The email must be addressed to Ms Pooja Sharma. The scheme has two separate e-mail IDs, where applicants can drop a mail and get answers to their queries. These two e-mail IDs are varunmitra.nise@gmail.com and startups.nise@gmail.com. Apart from this, interested applicants will also be able to attain pertinent information by calling on the helpline numbers. The numbers are 0124-2853039, 9999725683 and 9818156427. The renewable energy sector is still majorly untapped in India. Lack of information and infrastructure are the primary reasons behind this. With the implementation of this scheme, the central government is paving the path for access to information. All interested applicants will be able to get the training and join these sectors promptly.